Soon Shine is an action-puzzler available from the Wii U eshop and developed and published by Dahku Creations the masterminds responsible for the tough-as-nails platformer Chubbins which was also released earlier this year! But what did we think of this new Wii U eshop title? Continue reading this review to find out! 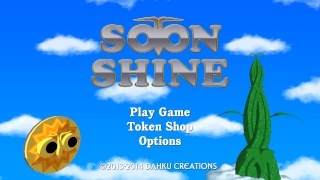 Soon Shine has players utilizing the sun and the moon to destroy spirits that are moving towards the center of the screen to destroy the celestial bodies. 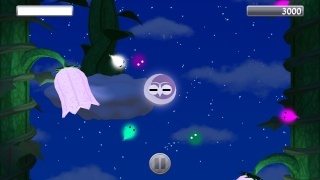 You must use the touch-screen controls of the Gamepad to destroy these spirits! If these spirits reach the center of the screen your health will decrease and once it reaches zero it's game over. 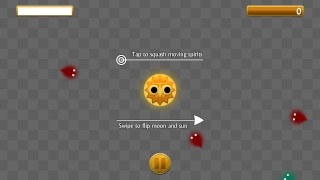 The spirits also exist in different planes forcing you to switch between the sun and the moon to defeat various enemies. Also to score big you should try to destroy many spirits in a row that are of the same color! The game also features several modes that have various rules such as no item use to make things interesting! Speaking of items the game features a token shop where you can spend tokens earned in the game to buy new backgrounds, new music, and items to help you during your next game! Soon Shine while fun becomes repetitive very fast, but since it's such an affordable title it's not a major issue. Soon Shine also features Off-TV Play and it's a great feature that works flawlessly while the controls are for the most part very easy to learn and use, though switching between the sun and the moon can sometimes not register properly, however this doesn't happen very often. The graphics in the game are fairly basic and don't really impress with the art-direction, and the music isn't overly catchy or memorable, but they aren't bad either. Sort of like that one person you're friends with who blends into the crowd and isn't really noticed even though there's nothing wrong with the person. All-in-all the audio-visual side of this game isn't bad, but really isn't something you'll notice much during the game. With decent gameplay, relatively easy and responsive controls, and great use of the Gamepad Soon Shine is a solid action puzzler title that is worth looking into, but with a weak audio-visual direction and low replay value it certainly has its share of flaws, however at its price these issues can be easily overlooked. We give this game a solid recommendation! Does this game have an online leaderboard? This game is WAY too iphone appy imo. I would have given this game a 5 or 6.